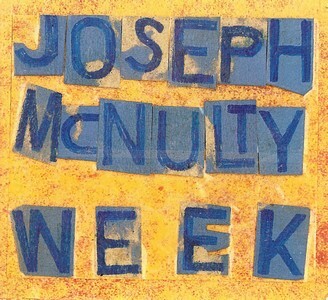 “Week” is a fun little release from Joe McNulty, who uses the 3′ format to deliver seven varied songs, each ranging from 2-3 minutes and named after a day of the week. Because of the theme of this cd, I’m going to try something a little different and give each day/song a quick synopsis. Tuesday – Deep shoegazey guitars spread across the land. Tuesday is melancholic and reflective. Wednesday – Hump day brings a loose, jangly pop song about the course of the day, getting up, lunch, smoking, watching tv, going back to sleep, etc. McNulty provides some suitably drowsy vocal stylings. Thursday – Electronic flourishes rise and fall while robots build a house. Many changes; jazzy interlude, spaceships land, the robots scream. Thursday is crazy, man. Friday – Ah, the gentle acoustics help buffer the hangover from Thursday. Another groovy living room pop song emerges with a reedy thing blowing. Gotta go outside, that’s what Joe says. Saturday – The dream guitars billow and amass. indiscriminate percussion and melodies give way to more bouyant picking. Dogs bark and approve of this direction. FR Un bébé qui fête son premier anniversaire est encore un bébé, un blog qui fête son premier anniversaire est déjà un vieux blog. J’ai du mal à croire que je suis encore là un an plus tard, à construire patiemment une collection de disques virtuelle… Quoi qu’il en soit, retour à un de mes labels favoris avec ce petit objet artisanal. Une chanson par jour pour une semaine, la limite de l’exercice est dans l’énoncé. C’est lo-fi, modeste, ça ne gagne pas à tous les coups donc ce ne sera pas le disque le plus crucial de la semaine, tout en restant très agréable justement par sa modestie et sa spontanéité. Et quand certains se prennent pour des génies sous prétexte qu’ils passent deux ans enfermés dans leur studio pour régler un son de batterie (ce que personne ne remarquera en le téléchargeant), ça fait plaisir et ça rafraîchit. ENG A one year old baby is still a baby, a one year old blog is already an old blog. I can hardly believe I’m still here one year later, patiently building a virtual record collection… Anyway, back to one of my favourite labels, A Beard of Snails once again. Seven songs for seven days, of course nothing crucial or groundbreaking, but modest, refreshing and very pleasant lo-fi pop tunes here. Lovely little music on a lovely little object (but now sold out). Cet article, publié dans Indie, Lo-Fi, est tagué A Beard of Snails, Homemade, Joseph McNulty. Ajoutez ce permalien à vos favoris. A lot more from A Beard of Snails previously posted here (Pine Smoke Lodge, Mark Bradley, Bruno Duplant…). Follow the good old tags for details.